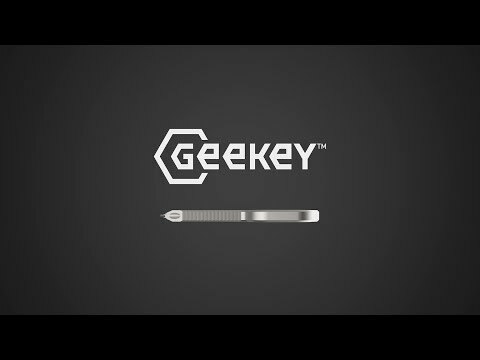 Geekey is an innovative, compact multi-tool like nothing seen before…it’s truly a work of art with engineering that combines everyday common tools into one sleek little punch that delivers endless capability. Geekey features many common tools that have been used for decades and proven essential for everyday fixes . . .
Geekey is a solid chunk of 420 Stainless Steel featuring over 16 tool functions that each provide multiple uses. Geekey’s durability and ultra-compact design allow it to be an easy companion for your every day carry. Geekey provides a wide range of functional possibilities allowing it to quickly and conveniently aid you in many different scenarios. A 420 Stainless Steel rugged hand tool and it can withstand any tough task you bring its way. or just hanging out with friends, you’ll always be prepared. Geekey is made by Metal Injection Molding (MIM) 420 Stainless Steel and then heat treated to H900. Both the material and injection process were selected to ensure that Geekey could withstand a lifetime of use.